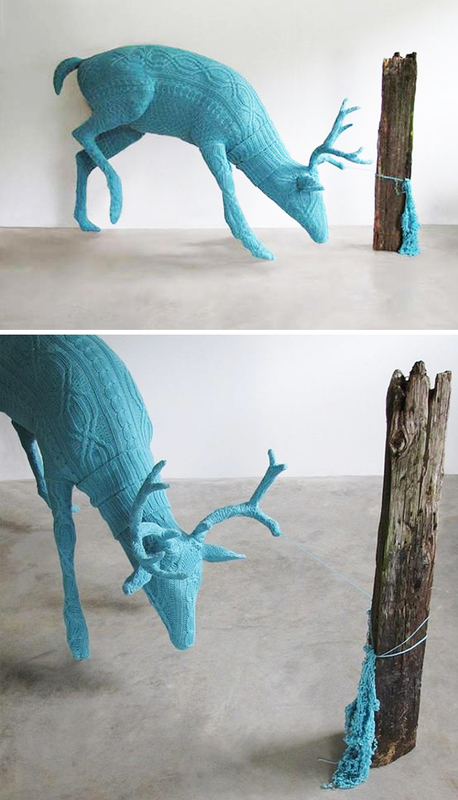 Pink cashmere, cable knit covered deer. Sigh. I have loved the artwork of American artist Rachel Denny since way back in 2009, but today is the first time we’ve ever spoken! I had A LOT of questions, and she had lots of answers. One thing that became very clear very quickly – she is one handy woman! She works with so many materials and does it with ease. Also, she owns four yaks. I realize I sounded like a bit of a Facebook stalker during this episode, but just wait until you scroll down to see not only her gorgeous work, but also photos of her yaks playing hide n seek and tag! Now I want yaks. Anyway, listen right up under those lovely pink bucks, or you can subscribe on iTunes. Ah, and there’s my Rosie – so gorgeous! Amazing, yes? There’s the chenille covered moose commission she mentioned, and I’ve also included the turquoise angora-covered rabbit we talked about. Seriously, it’s just all too good. Whoa. That snake. Gorgeous, but if I saw him in my yard I would lose my mind. Here are a few things Rachel sees in her yard every day… YAKS! Stunning. And there’s the belt bull we were talking about. Isn’t he majestic? The amount of work she puts into each piece is just mind blowing. 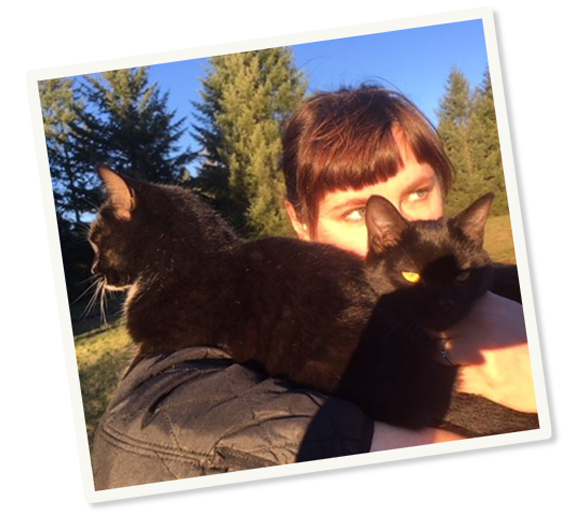 Yep, covered in animals! Thanks to Rachel for figuring out Skype so we could chat; thanks to Saatchi Art for supporting the episode, and thank YOU for listening! There will be more art for your ear next weekend. « papirmass : give-away x 3! Beautiful and unexpected artistic tributes to our animal friends. Her work is STUNNING! well jell!! Loved listening to this. 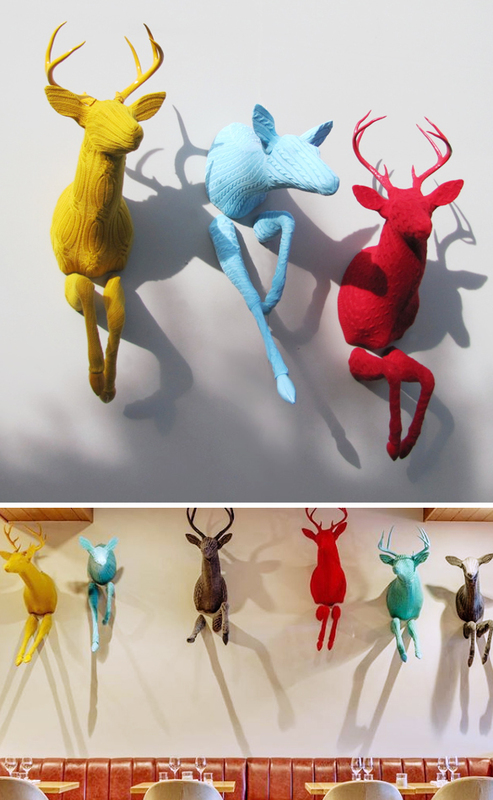 These are the best reinterpreted trophy animals I’ve seen. Love it! 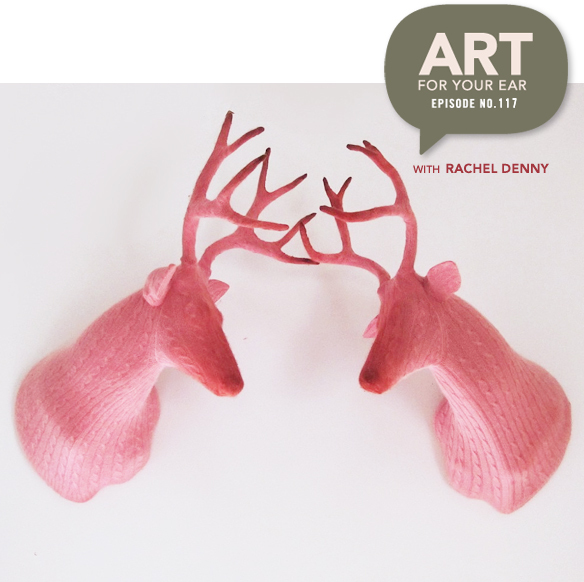 First pod cast I’ve listened too and it was good fun 🙂 Really want to make a deer head now.